And then the best music to listen to in a great Gothic church is the polyphony which was written for it, and was calculated for its resonance: this was my approach in the War Requiem – I calculated it for a big, reverberant acoustic and that is where it sounds best. I believe you see, in occasional music, although I admit there are some occasions which can intimidate one – I do not envy Purcell writing his Ode to Celebrate King James’s Return to London from Newmarket. On the other hand almost every piece I have ever written has been composed with a certain occasion in mind, and usually for definite performers, and certainly always human ones. When I am asked to compose a work for an occasion, great or small, I want to know in some detail the conditions of the place where it will be performed, the size and acoustics, what instruments or singers will be available and suitable, the kind of people who will hear it, and what language they will understand – and even sometimes the age of the listeners and performers. For it is futile to offer children music by which they are bored, or which makes them feel inadequate or frustrated, which may set them against music forever; and it is insulting to address anyone in a language which they do not understand. The text of my War Requiem was perfectly in place in Coventry Cathedral – the Owen poems in the vernacular, and the words of the Requiem Mass familiar to everyone – but it would have been pointless in Cairo or Peking. During the act of composition one is continually referring back to the conditions of performance – as I have said, the acoustics and the forces available, the techniques of the instruments and the forces available, the techniques of the instruments and the voices – such questions occupy one’s attention continuously, and certainly affects the stuff of the music, and in my experience are not only in a restriction, but a challenge, an inspiration. Music does not exist in a vacuum, it does not exist until it is performed, and performance imposes conditions. It is the easiest thing in the world to write a piece virtually or totally impossible to perform – but oddly enough that is not what I prefer to do; I prefer to study the conditions of performance and shape my music to them. Where does one stop, then, in answering people’s demands? It seems that there is no clearly defined Halt sign on the road. The only brake which one can apply is that of one’s own private and personal conscience; when that speaks clearly, one must halt; and it can speak for musical or non-musical reasons. 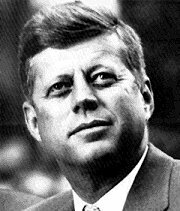 In the last six months I have been asked several times to write a work as a memorial to the late President Kennedy (Pliable – don’t forget this was written in 1964). On each occasion I have refused – not because in any way I was out of sympathy with such an idea, on the contrary, I was horrified and deeply moved by the tragic death of a very remarkable man. But for me I do not feel the time is ripe; I cannot yet stand back and see it clear. I should have to wait very much longer to do anything like justice to this great theme. But had I in fact agreed to undertake a limited commission, my artistic conscience would certainly have told me in what direction I could go, and when I should have to stop. 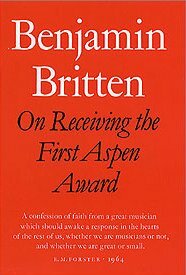 Benjamin Britten received the first Robert O. Anderson Aspen Award in the Humanities to honour ‘the individual anywhere in the world judged to have made the greatest contribution to the advancement of the humanities’. Although the Aspen Award never achieved the currency of the Nobel prizes there were similarities, not the least being that Alfred Nobel made his fortune from explosives, and Robert O. Aspen made his from petroleum. The header photo shows the unique, and sublime, performing space that Britten created in the Snape Maltings (image credit Jeremy Young via Architecture Week). Britten was a true humanist. As well as being one of the 20th century's most important composers he was responsible for the post-war opera revival in Britain, advocated Purcell and other neglected early composers, started a festival that showcased contemporary music, and built (and rebuilt) one of the world's finest concert halls. His love for the Suffolk coast, portrayed so vividly in the Four Sea Interludes, predated today's environmentalism by decades. He lived in an openly homosexual relationship in the dark days when such arrangements were still illegal in the UK, and in the War Requiem made one of the great pacifist statements of our time. He was an international standard pianist and conductor, championed Russian music and artists during the Soviet Unions darkest hours, and was the dedicatee of Shostakovich's Fourteenth Symphony. 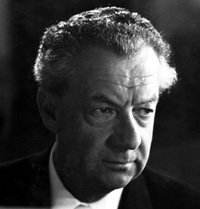 Britten's music most certainly does not exist in a vacuum. But, despite this, Bernstein retained his affection for Britten's music. Bernstein's last concert, given in Tanglewood with the Boston Symphony Orchestra just months before his death in 1990, included a heart-stoppingly slow, but immensely moving, performance of the Four Sea Interludes. Which brings this particular Overgrown Path full circle, and back to where we started in Aldeburgh, Suffolk. What an interesting essay about probably my favorite composer, and how important actual spaces are/were to his compositions (and by extension, most great composers). 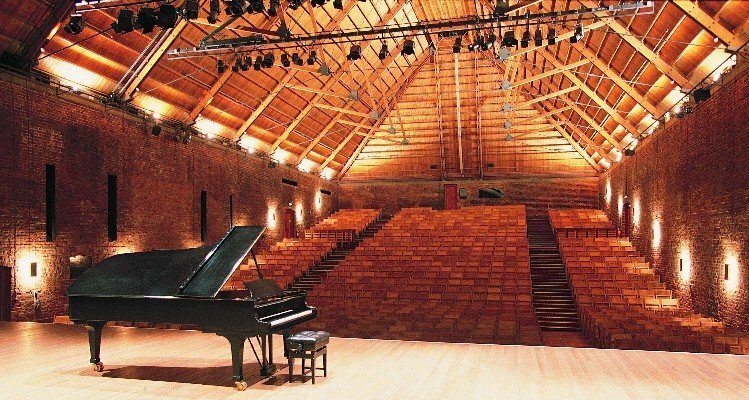 And thank you for that wonderful photo of the Snape Maltings concert hall. I had no idea what it actually looked like, and it's more beautiful than I had imagined. Live Britten performances are almost always more interesting than the recordings, as great as many of them are, especially those conducted by the composer. He really was given an amazing number of musical gifts, wasn't he? "Noye's Fludde" was performed during a recent United Nations anniversary in San Francisco by a Canadian troupe of 50 children, teenagers and adults in a small Presbyterian church downtown. When the trumpets rang out for the triumphant finish from the top and the back of the church, I just about floated off this earth. What an amazing piece of music, especially when performed live at the right location with the right mixture of professionals and children of all ages. Conversely, I saw the fine men's choral group Chanticleer have a go at "Curlew River" in a "Japanese zen" staging at a warehouse-like theater once. It was completely wrong and totally uninvolving, which gets back to your point. The piece was written to be performed in a small church, mixing East and West and a Grieving Drag Queen in a totally fascinating way, and a dimly conceived, avant-garde staging in a warehouse was just missing the point. "The War Requiem" I walked out of when it was performed at Grace Cathedral, San Francisco's big modernist Catholic church which is interesting as architecture but is a true acoustic disaster for music. The one, overwhelming version I've heard was at the local symphony hall with Donald Runicles conducting, who is awesome with Britten's music. Basta! Thanks again for the Britten appreciation. sfmike - follow this link for more thoughts on Curlew River. finishing a three-parter on Wagner - last part will be out later on in August. I write on Poetry and Culture for 3QD. Hope you enjoy some of this stuff. 'Britten never composed a memorial to J.F. Kennedy' - but there was one tragic link. Britten was born on 22 November 1913, and J F Kennedy was assassinated exactly 50 years later, 0n 22 November 1963. 22 November is also the name day of St Cecilia, the patron saint of musicians, and of infinitely less import, it is also my birthday.